Rosacea can be an embarrassing and conspicuous ailment that effects many people. As a chronic form of adult skin blemishing, it is an acne-like condition which, although ongoing, can be managed easily through consistent treatment or with the help of dermatological experts. If you feel like your Rosacea is getting in the way of your livelihood, seek a dermatologist for the best advice geared to your condition. 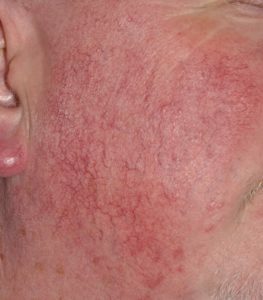 Rosacea is a skin condition which includes symptoms such as overall redness, flushing, spots, pimples and Telangectasias (red vascular lines). Because of their prominent position on the face, they can make patients deeply uncomfortable as they resemble the effects of sunburn or alcoholism. At worse, patients may suffer from severe eye problems due to swelling eyelids. Although the condition is often referred to as an acne-like condition for adults, it does not produce the same blackheads; nor is it triggered by the same causes. Instead, patients can expect general reddening and flushing of the face, soreness, burning and small cysts, pustules and bumps on the skin. Rosacea is mostly genetic. Other than that, there is little scientific consensus on the causes of this skin condition. For those suffering the condition, there are many triggers which can cause sporadic outbreaks. Alcohol, smoking, spicy foods, bad diet, stress, anxiety and environmental conditions can all cause outbreaks. As such, many patients are able to record and understand personal stimuli for their own Rosacea. In many cases, lifestyle changes can help alleviate the worst Rosacea cases. The good news for Rosacea sufferers is that although the cause of the condition is still little known, the ways of controlling and diagnosing it are. That doesn’t mean, however, that there is an easy cure and that Rosacea is preventable; you can reduce the triggering factors which cause the condition rather than the condition itself. As such, aside from lifestyle changes (noticing what creates breakouts in each case and limiting them), patients can use medication designed for acne, topical antibiotics and treatments such as Metronidazole or creams loaded with Azelaic acid. Given the variety of treatments and the differences in Rosacea per patient, seeking a dermatologist in the Manchester area will help highlight the best treatment. For one, patients need to first be properly diagnosed. As Rosacea symptoms resemble many other skin conditions, an expert is best placed to make a diagnosis. If you are suffering from consistent flushed red skin and spot outbreaks, it is best to diagnose early to prevent any complications.